As someone who loves both media, fandom, writing about fandom and media, and reading writing about fandom and media, I was a bit disappointed to read Devin Faraci’s “Fandom is Broken” on Birth. Movies. Death a few days ago. As soon as I saw the word “entitled” brought up in the context of fan-creator engagement, I realized that not only is Faraci incorrect on several levels about why fans are becoming more open with their desires and more engaged with creators of living media who have the power to change stories, but that he is also unwittingly playing into well-worn tropes about how young people (who are fans of things) should act in the face of dealing with things they don’t like—rather than realizing that media is imperfect, often harmful, and can and should be changed to be more inclusive and reflective of society’s diversity, he groups both the hashtag campaigners and those who send death threats (which is inexcusable) under the same umbrella, claiming that fans being given more agency has led to fandom being “broken”. Below are some of my thoughts on Faraci’s piece, and my response to his claims as a young fan of things. It is not wrong for fans to want more from their media. As the country grows more and more diverse, or, in some cases, more accepting of existing forms of diversity and difference, it is absolutely within the rights of the consumer to see themselves represented in the media they consume. The hashtags #GiveCaptainAmericaABoyfriend and #GiveElsaAGirlfriend (along with the fan investment in making Star Wars’ Poe Dameron gay) are far from entitled whiny babies demanding something utterly out of the question; some estimates have around 8-9 million Americans identifying as LGBT, with numbers growing higher as acceptance for LGBT individuals becomes more and more widespread. if you really do want to apportion characters in media across lines of difference, then by that logic in 2042 white people will only star in half the things, as opposed to nearly all of them, while technically the most common demographic on earth is Han Chinese, not your average white guy currently headlining nearly all of CBS’s slate for the coming fall television season. Representation absolutely matters in both positive and negative ways. Before I got to college, I had never met any Muslims in my home community. If I had had to use the media to inform me on what Muslims were like, and if I hadn’t grown up in an open-minded community in liberal Los Angeles, I would have assumed they were all terrorists, whether we are talking about shows like 24, Homeland, or the evening news. If giving Elsa a girlfriend (though why there even needs to be a sequel to the overrated, mediocre Frozen is another issue entirely) or if allowing Captain America in the MCU to act upon the oodles of subtext and chemistry he has with Bucky or Sam means that young LGBT children growing up feel honored, valued, and loved, and if making these characters gay or bisexual has a sort of Modern Family effect of promoting general tolerance and acceptance, then why shouldn’t they be allowed to come out? Wanting more from your media is absolutely valid and allows writers to continue to challenge themselves by writing different kinds of characters and narratives that haven’t been seen before, or, in more positive circumstances, would allow for a more diverse writers room, then I really have no problem loosening the white male heterosexual stranglehold on Hollywood and the media in general. On a further note, comparing clamoring for a currently-running comic book series or planned sequel to be more inclusive is not the same as demanding to have all of the blue painted out of a Picasso. That’s a lazy strawman argument that misunderstands the mutability of contemporary media and likens the Twitter campaigns to wrecking a work by a dead artist without their permission or knowledge. We are paying for this media–if we’re going to get all economical about this, media that disappoints fans in a free-market system deserves to get cancelled/end/lose money, etc. To put it in more touchy-feely terms, why argue against respect and inclusion? Twitter hashtag campaigns are not equivalent to online bullying or death threats, and it’s intellectually lazy to paint them with the same brush. Death threats are inexcusable and represent an absolute breach of manners, propriety, and boundaries. The hashtag campaigns around Frozen and Captain America are not threatening anyone in the least, unless you happen to be threatened by people getting tired of the same heteronormativity present across all forms of creative media–which I totally could understand–if you’re a mediocre white male writer whose livelihood is called into question by people tired of the same old stories we’ve seen over and over again. It is absolutely important, in this age of constant interaction and connectivity between fans and creators, for the latter to make sure that they do not abuse the trust of their fans. Fans protesting The 100’s use of the “Bury Your Gays” trope earlier this spring were right to call out, question, and condemn the show executives’ duplicity and disrespect towards Sapphic (women loving women) fans of the show. In this case, the writers actively queerbaited the fans, promising that Clarke (Eliza Taylor) and Lexa (Alycia Debnam-Carey) would have a happy relationship that wouldn’t involve, say, one of the pair getting killed by a stray bullet a la Tara from Buffy, even at some points actively going into LGBT online spaces to plug their show and mislead fans starved for any positive Sapphic representation on television, only to then take advantage of their increased viewership and goodwill by employing the exact same cliché they promised to avoid. Fan reaction was swift and condemning and rightfully so, with Jason Rothenberg, the showrunner, later apologizing and promising to do better next time. While the damage has been done, and the trust in The 100 lost for good, hopefully at least one person learned something important, and the outpouring of think pieces in mainstream publications means that this kind of fan interaction with creators, and the trust fans must have in creators for shows to succeed, is becoming increasingly important. Of course, going off his article, Faraci would not hesitate to condemn the upset fans who had been deliberately manipulated into serving the purposes of the show, rather than those affiliated with the show who entered fan spaces in bad faith, because fans tired of begging for scraps are clearly just whiny. As I am not a fan of comics and only have seen a bunch of the MCU films, I won’t dwell upon Faraci’s argument about whether making Captain America Hydra is anti-Semitic. As a Jewish fan of MCU, I think it is–but it’s not only the issue with Hydra-Steve that has Jewish fans feeling upset with Marvel and the MCU in general. 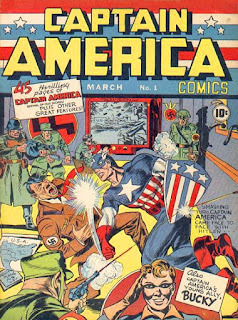 It’s more that transforming cap, created by Jews to literally punch Hitler in the face as an extension of the golem mythos in Jewish folklore, merely represents Marvel’s apathy towards their Jewish fans. After all, the MCU took canonically Roma Jewish characters Pietro and Wanda, whitewashed them, erased their Jewish heritage, and had them literally volunteer to help Hydra, which is for all intents and purposes a Nazi organization in the MCU (stated both in Captain America: The First Avenger and Agents of Shield), while Fox has erased Kitty Pride’s Jewishness from the record of the X-Men films. Having Pietro and Wanda not being Magneto’s kids is understandable due to the licensing issue, but why couldn’t they have been Jewish, when Matt Murdock’s Catholic faith is one of the most important parts of his character in the Daredevil series? For many fans, having a character created by Jews to face one of the worst threats the Jewish people have ever known turn out to be a member of an organization still for all intents and purposes characterized as Nazis, after the erasure of other Jewish characters and excessive demonization of the most iconic Jewish character in comics (Magneto) reads like disrespect. The most touching moment in X-Men: First Class was Magneto remembering celebrating Hanukkah with his mother–clearly we are not afraid to wring pain from the Jewish experiences of our Jewish characters. Why not allow Jewish fans to celebrate the Jewishness, both on the panel and screen and at the drawing board, of Marvel comics? 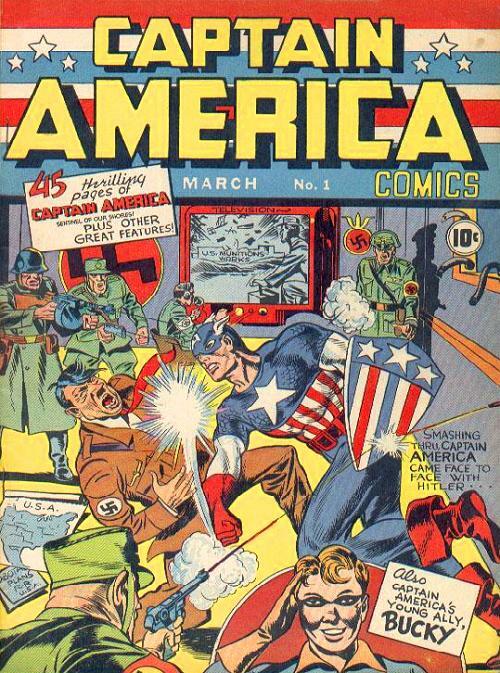 Especially in a political climate that is becoming increasingly unsafe for Jews, regardless of whether we are in Europe or the US, why can’t we have our escapist fantasies of Jewish superheroes and the ultimate expression of goodness and the best of America protecting us like he should be? Also, perhaps this is entirely different in the comics, but it is definitely not the case that Hydra was not Nazi in the MCU. It’s explicitly referred to as the Nazi science division in The First Avenger, and Daisy Johnson in Agents of Shield, when confronting Grant Ward, refers to the organization’s Nazi past. I don’t understand if Faraci is trying to argue that new Hydra either isn’t all that bad since they are apparently not Nazis anymore, or if perhaps the emblem of goodness being a Nazi is inherently not a big deal. Either way, he and other comic book fans who deny the problems Marvel has with Jewish readers and characters in the way perhaps need to take a closer look to what Jewish comic book fans are saying. American Millennials today have gotten a pretty rotten deal in a lot of ways. We’ve inherited an economy with staggering gaps between the wealthy and the poor, high school is increasingly harder and more stressful, college is both harder to get into and costs more than the salaries we will earn after graduation, the job market is terrible, and the mistreatment of the planet caused by people working before we were even born means that our own grandchildren might have to fight for a place to live. So for continuous thinkpiece after thinkpiece to write off our desire for escapism that is truly escapist and enjoyable, where we can all be equal and heroic no matter what our differences, as entitled, reeks of dismissal and a lack of understanding of our generation. We get criticized for not being active enough in politics while simultaneously not practicing politics the way the old guard would like us to, where legitimate protests are shrugged off in favor of the vague idea of civil dialogue, as if protests and direct action didn’t get disenfranchised citizens what rights we do have, where we are told that maybe we should just shut up and be happy with what we are given. If we can’t change anything else, we should at least be able to be respected for demanding that the media we consume every day of our lives, that we are expected to pay for, does not actively exclude, disrespect, or insult us.